BENJAMIN PRENTISS (1819-1901). 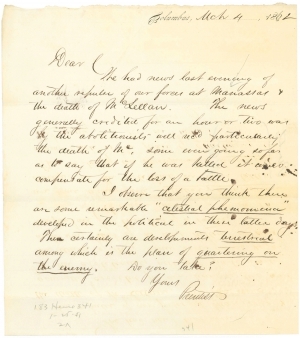 Autograph Letter Signed (“Prentiss”) Columbus, [Kentucky], March 4, 1862. 1 p., 7¾ x 8¾ in. I observe that you think there are some “celestial phenomena” developed in the political in these latter days. There certainly are developments terrestrial among which is the plan of quartering on the enemy. Do you take? Prentiss fought in the Mexican-American War and the Civil War, rising to the rank of Major General. He was captured at Shiloh along with 2200 other Union troops. He is often credited with holding the Confederate Army at bay in the area known as the ‘Hornet’s Nest,’ allowing General Grant’s army to survive the battle, and continue its trek into the South unfettered.